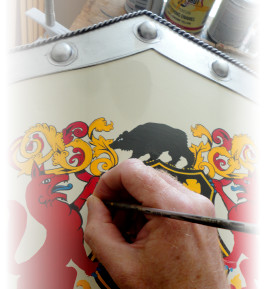 Your family coat-of-arms is hand-painted on our best-selling knight copper shield, sized to bring your family surname more vividly to life in all its historic color! And now, for a limited time, this special comes with a bonus gift—a FREE family name history—a $17.95 value. 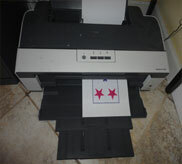 Now you can display your family coat-of-arms alongside the historical account of your family surname for no extra cost! The copper knight features European craftsmanship throughout with shields forged in the renowned Clissold metalworks. 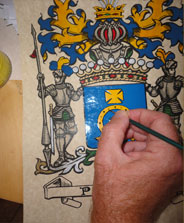 The family surname is hand-painted at the head, while the family motto or country of origin is added to the base of the shield, and then placed on a walnut wood display. This Family Name History provides an in-depth look at the origins of your family surname, individually researched from authentic sources. Discover the origin of your family surname, its first recorded uses and other notable people who share that surname. Each name history includes the Blazon of Arms—the written description of the coat-of-arms—which is hand-painted on the Copper Knight plaque as part of this special! Thousands of family name histories have been carefully researched on all nationalities. This Family Name History is unframed, so you can create your own custom look, and is absolutely FREE with this special (for a limited time only)! Or, you can upgrade to Framed Family Name History.